Brother Martin has been the favorite to win their fifth consecutive Division I state championship since the season began. After this weekend the De la Salle Cavaliers stated their claim as favorites to win Division III. Only the Division II favorite remains uncertain at the moment. Live Oak officially won their second Lone Survivor Division II championship on Saturday (photo below left). It can be counted as their third, as last season the Eagles placed second by a mere half-point to Division I's Airline High School. This time Live Oak scored 232 points, 43.5 more than runner-up Parkway (188.5 points). 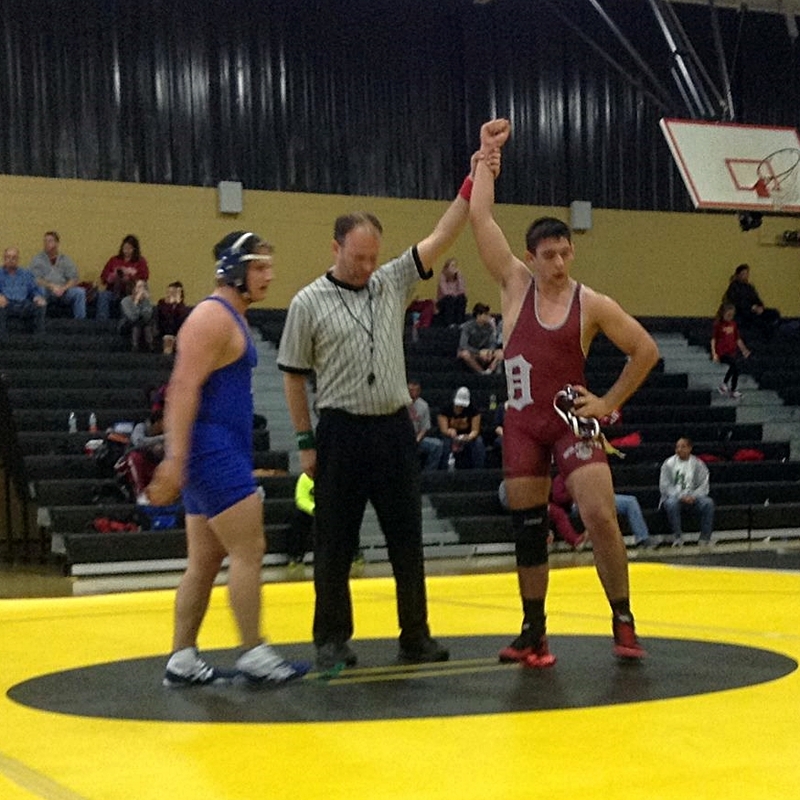 While Live Oak had two individual champions (photo right) host Parkway and Haughton had three. Garrett Strozier, Nathan Pitts and Levar Allen won titles for the Panthers, and Dylan Holliday, D.J. Monroe and Johnny VanVackhoven did the same for the Pirates. C.E. Byrd had champions in Clay Celli and Alec Williams. The remaining four titles went to Central's Trey Fontenot, Huntington's D'Anta Anderson, Rayne's Devonte Robinson (left) and Ethan Wood of St. Thomas More. Ethan Alfonso (138 lbs.) and Brennan Webb (145 lbs.) won back-to-back championships at the 2016 Parkway Division II "Lone Survivor." The event did little to make the case for a clear-cut favorite for the Division II state team championship. Teurlings Catholic may be a favorite, but the Rebels have yet to square off against Live Oak or Division II newcomer Rummel. The St. Paul's Wolves, who are proving to be Brother Martin's main competition for the Division I state championship team title, proved once again that they are the dominant force in St. Tammany Parish. St. Paul's scored 335 points to their opponents' 56 in winning the District 6-5A (St. Tammany Parish) Duals Championship on Saturday. Fontainebleau (photo left) placed second via a 58-24 win over Covington, who placed third. 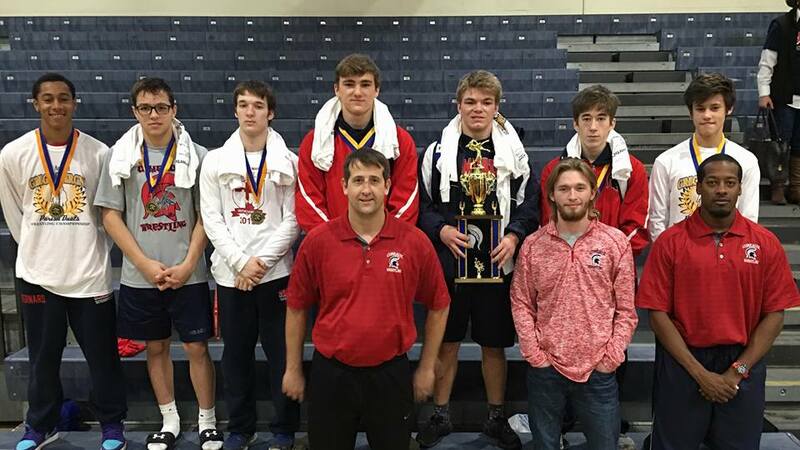 Archbishop Hannan, which only had two wrestlers last season (their first) and did not participate in the 2015 LHSAA state championships, placed a surprising fourth, besting Pearl River and Mandeville. 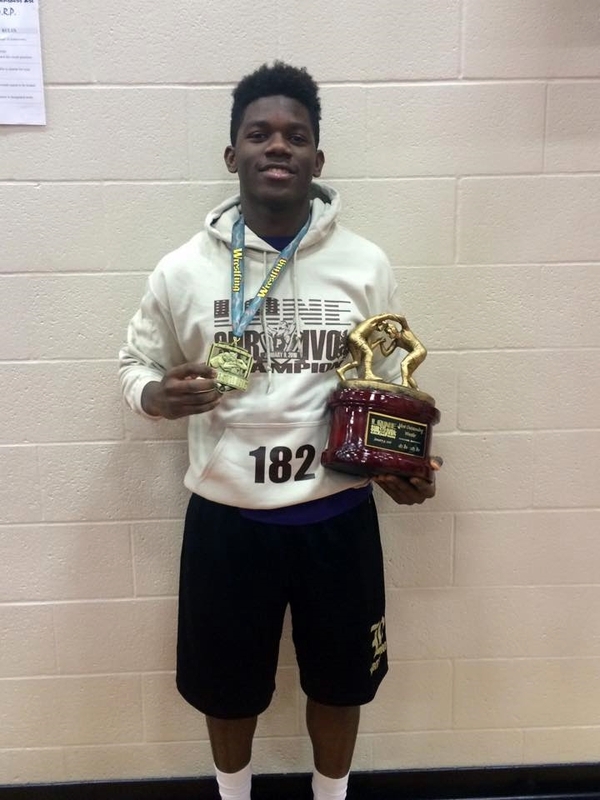 Brother Martin won the first five weight classes and added a sixth title en route to winning the Bruin Invitational held on Saturday at Bonnabel High School. Kohl Prest, Justin Leal, Dominic Holbrook, Michael Kospelich and Gavin Wright won titles for the Crusaders. Destrehan had two champions in Tyler Wehrlin and Chase Menendez, who notched his 100th career win at the event (photo right). The Owls of Chalmette also produced two winners in Michael Fos and Isaiah Gipson. The remaining titles were won by John Ehret's Joseph-Davis Lucas, Fisher's Troy Bourgeois, Crescent City's Jacob Pelle, Chase Stuckey of Baton Rouge and Justin Frost of Riverdale. The Crusaders won the team championship with 179 points, besting Chalmette by 80 points and Baton Rouge by 93 points. 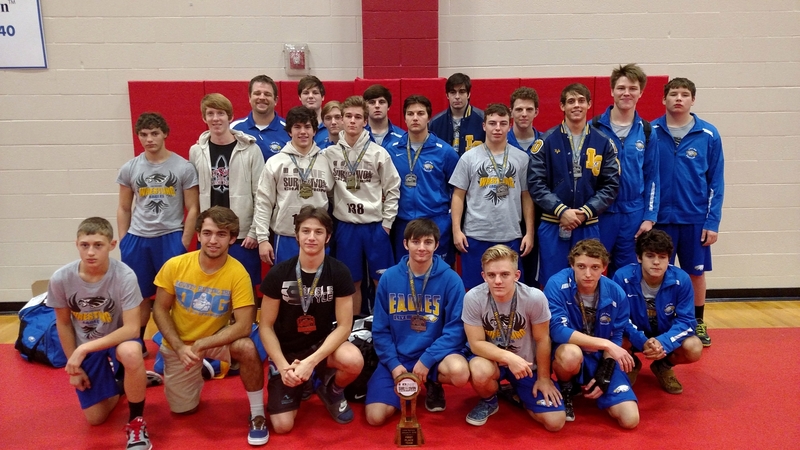 Comeaux reestablished their claim at the top team in central Louisiana with a 6-0 record at the Greg Lavergne Parish Dual championships, held at Comeaux high school on Friday and Saturday. The Spartans' main competition were the Rebels of Teurlings Catholic, who ousted them as champions last season, ending a 13-year run. Comeaux defeated their crosstown rivals 42-27. The loss to Comeaux, however, was not the only one suffered by the Rebels. Lafayette High School surprised Teurlings with a 42-34 win, which earned the Mighty Lions second place with a 5-1 record (Comeaux defeated Lafayette 46-27). Comeaux had seven All-Parish selections: Dylan Ames, Seth Oubre, Dyllon Bernard, Jake Verret, Evan Richards, Kole Miller and, albeit in a three-way tie, Hayden Parker. Colton Sonnier, Brock Bonin and Ryan Stewart earn First Team status for the Rebels. The surprising Lions had five First Team selections: Thaquan Priestly, Damien Lasseigne, Cullen Fonseca and Rodrigo Diaz. The remaining First Team spot went to Carencro's Austin Gary, who avenged a 5-3 Jacob McMillan finals loss to Teurlings' Kynan Sonnier with a 7-3 victory on Saturday. 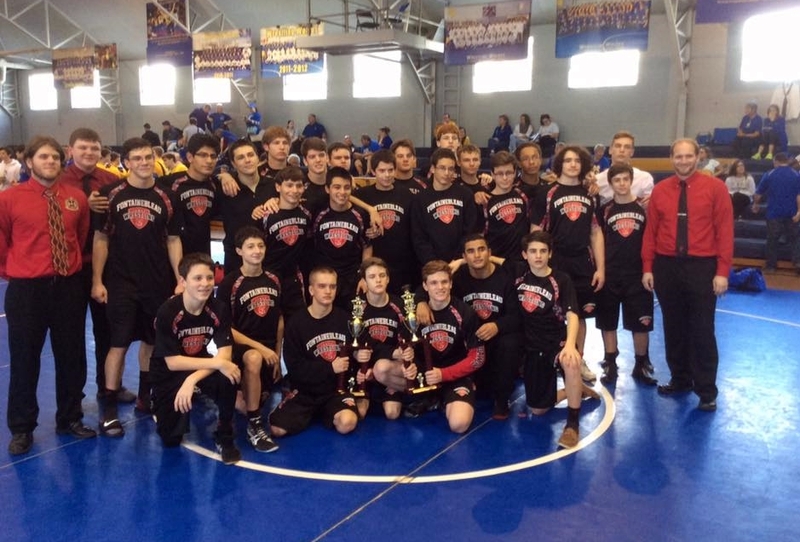 Baton Rouge Catholic placed fifth at the Scott Rohrer Hoover Invitational held on Friday and Saturday. Jacob Fereday and K.J. Wilson placed second for the Bears. Vestavia Hills of Alabama ran away with the team title, followed by Hoover, AL, Oak Mountain, AL, Arnold, FL and then Catholic. 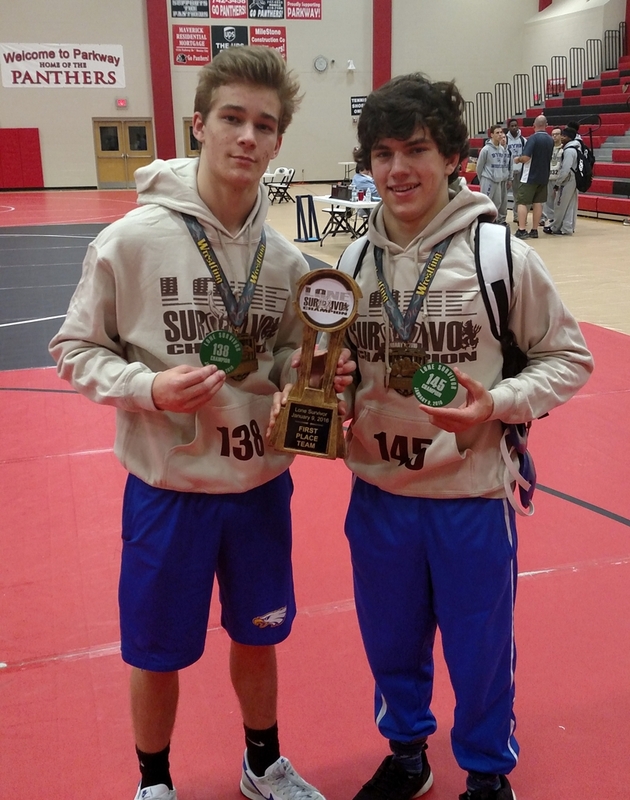 Ethan Pickren and William Pickren, who both should be familiar to many Louisiana wrestling fans, placed first and third respectively in the event for Arnold High School. 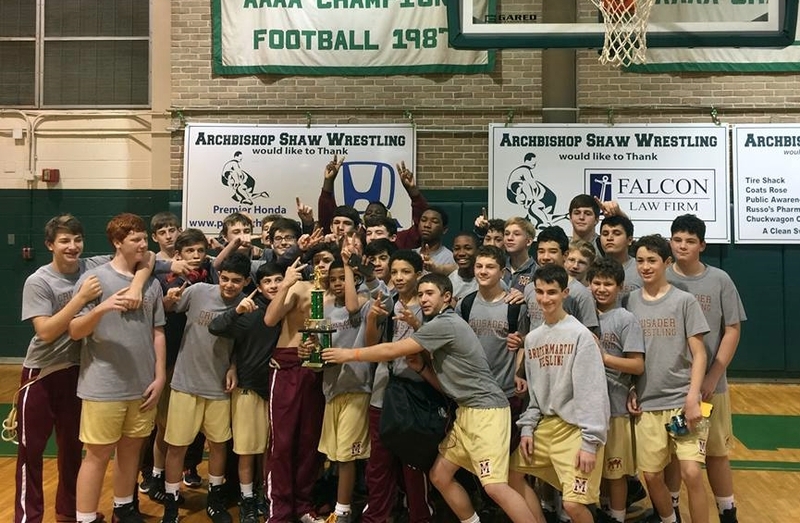 At the Junior High District duals held at Shaw on Saturday the Brother Martin junior high "Gold" team defeated St. Paul's 90-6, Holy Cross 57-24, a combination of Rummel and Shaw 78-6 to reach the championship match, in which they defeated Jesuit 70-21. Actually, the Crusaders won three events this weekend - all without a varsity starter touching a mat. Aside from the ""Gold" team's feat, the second team won the Cardinal Duals and the third string won the Bruin Invitational. 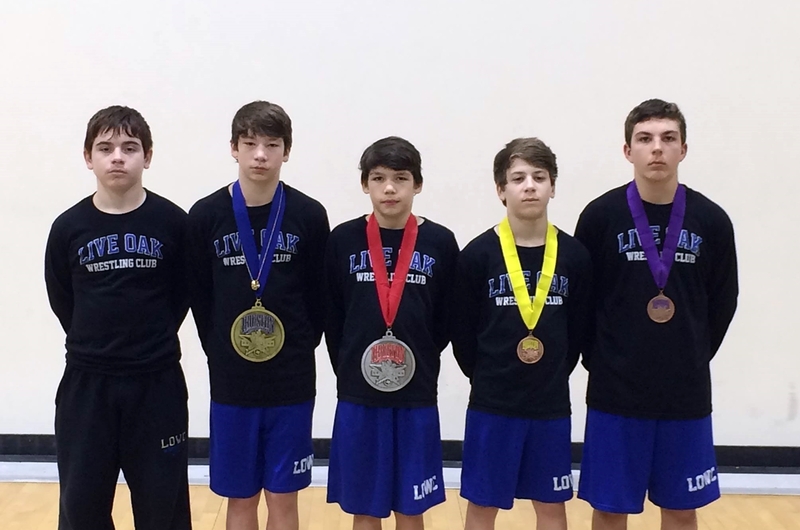 Five members of the Live Oak Wrestling Club travelled to Houston, Texas, for the Houston Nationals, held at The Woodlands High School ,just north of Houston, on Friday and Saturday. Four of them went home with medals. Camdyn Ingram won the Division 4 100 lbs. title; Rayden Ingram placed third at 100 lbs. in Division 3; Clayton Hill placed fifth at 85 lbs. in Division 4; Anthony Dodson placed sixth at 130 lbs. in Division 4. Also competing for the junior Eagles was Jordan Griffith. Griffith did not win any medals, but just to compete in an event like this provides outstanding experience to be used later in wrestling careers.